I had been debating the merit of testing a day or two before the official blood test. 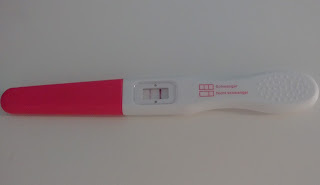 A single pregnancy test was in my drawer so it wasn't like I'd have to actually go out and buy any. For several days I went over the pros and cons of testing early. The main advantage being an extra day to "prepare" myself if it were negative. The last few days I have also had quite a few ups and downs. One moment convinced this hasn't worked as I don't feel anything and with my bad luck in terms of trying to have a baby why would it? I'd even started thinking what we would do if it failed. Places we could visit for instance Barcelona or Malta sprung to mind. I also was wondering whether it would then make sense to make an appointment at our clinic to find out their thoughts and how low are chances are. However then I'd remind myself to stay hopeful a bit longer. The evening before last I started noticing some twinges around my ovaries which I couldn't help thinking could be a good sign. I've also had heartburn quite frequently. Although anything can be a side effect from all the drugs and hormones! Ok, I'll get to the point... Before breakfast I decided to sneak away and do a test before hubby could tell me not to. Once I saw the dye initially just create the control test line and nothing else I looked away thinking "oh no, I can't bear this if it will be negative" and I started praying desperately while I waited. About minute later I peeked at the test and to my absolute shock there was a second line. I looked again closer. It was definitely there! I double checked the instructions on the test, I was doing it right. Then I burst into tears! Extremely happy tears. I was shaking from just feeling so overwhelmed. I'm delighted! I am honestly really happy to have come one step closer. When I went back to the bedroom to tell hubby who was only just waking up, I burst into tears again. At first he got worried and couldn't tell whether I was happy or sad! I managed to get out that they were "happy tears" as he hugged me. This is just stage one. The next hurdle is getting a good strong beta value at the blood test tomorrow. After our first IVF the HCG value was only 28 which implied it could end up being an early miscarriage which it sadly was. A number over 50 would have been better but ideally over 100. Hubby is still very apprehensive and worried. He told me he's anxious I'm getting my hopes up too much. I told him I am just taking it one day at a time and today I can be happy! I know I still have a long way to go. But the amazing thing is that one or both of our embryos implanted and as of right now, I am pregnant!! Please God the blood test will go well tomorrow. Oh my goodness!!!! Praying for you all should go well tomorrow and beyond! OMG I'm so excited and happy for you!!!! Praying for a beautiful, strong beta. Oooh congrats! Hope all goes well for the next stages! Thank you! One step at a time..
What wonderful news! Keeping everything crossed for you for a healthy pregnancy! Oh, two lines! TWO LINES! That is exciting. Such a test of one day at a time, but I have everything crossable crossed for tomorrow's beta. Man am I hopeful that it's all good news all the time for this round. 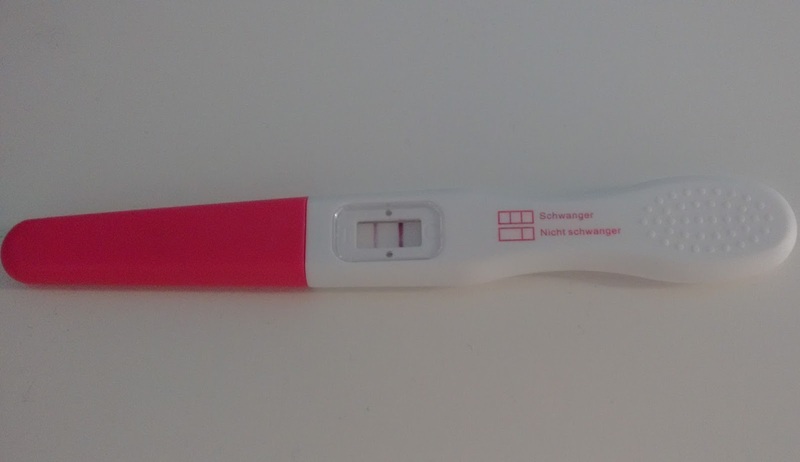 I can't stop looking at the test, so cool! Delighted to have passed this hurdle and be off to a good start. I'm soooooooooooo happy for you!!! I didn't want to say anything your last post because I didn't want to raise your hopes. But my gut has been that things would go very well for you this cycle. I'm still worried about raising hopes, but when I thought about you my instincts said "things will work out". I'm still worried that maybe their wrong and maybe I shouldn't say anything in case they are. But I have a very positive feeling when I think of your situation, like dark clouds are parting. I hope that doesn't sound weird. You've waited so long for this moment! So happy for you! Ahhh have amazing news!! I'm so so pleased for you! That's a really strong line too :) Good luck with the beta. Keeping everything crossed for you. Hurrah!!! Thanks so much! It's a stronger line than I had after IVF when I later miscarried which to me is a good sign it's a stronger pregnancy! Yay! Aaaaah!! I'm so happy for you!! Keeping everything crossed for a nice high HCG value. That is amazing! You are absolutely entitled to be happy today. Good luck for the beta! Thinking of you! Thanks Nora, that's so sweet! Yes, I'm going to enjoy this wonderful moment! This post was the first thing which popped up in my main this morning and I am so happy for you. Is this for real? Overjoyed!